The City of Cleveland hasn’t had a legitimately contested mayoral election since 2005, with incumbent Frank Jackson having run essentially unopposed in the two elections since then. Jackson will be the longest-serving Mayor in Cleveland’s 200+year history by the time his current term is up, and now folks are hearing that he’ll run for yet another four-year term in 2017. There’s less reason than ever to suggest that it’s not his if he wants it. Case in point, this year’s Ohio gubernatorial race that incumbent Republican John Kasich is expected to win in a landslide over Democratic challenger Ed FitzGerald, the current Cuyahoga County Executive. Kasich will waltz to his second term as Governor despite having won by only a two-point margin with 49% of the vote the first time around, and despite that the great majority of Ohioans are worse off than ever on his watch. According to uncontradicted research by Policy Matters Ohio: Job growth statewide is fourth worst among states since 2005, and the percentage of working Ohioans is at a 34-year low; For those who are lucky enough to be working at all, median hourly wages are down despite massive productivity gains, and 11 of the state’s 12 most common occupations “pay too little to get a family of three above 150% of the poverty line;” So, naturally, the bottom 99% of Ohioans make less than they did a generation ago while the top 1% makes 70% more. Which is to say nothing of Kasich’s decisions to sell our environment to the oil companies, our education system to venture capitalists, and our reproductive rights to his party’s lunatic fringe. 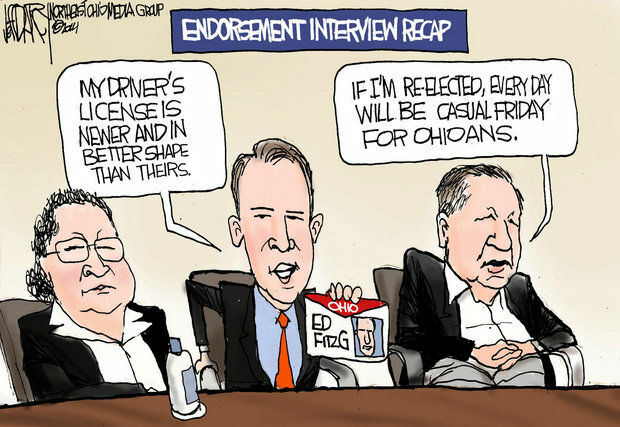 Yet there will be no real election for Governor of Ohio this time around, and Cleveland’s only “daily” newspaper would have us believe it’s because FitzGerald didn’t have a drivers license for a few years and was once spotted in a parked car with an Irish lady in Lakewood at 4 AM. Count them, 45 stories at Cleveland.com about FitzGerald’s parking/drivers license improprieties published over the last three months, and then try to find a single piece of concise and comprehensive analysis by the Plain Dealer/Northeast Ohio Media Group comparing the two candidates’ policies. Of course, Kasich doesn’t answer any questions about his policies and record because he doesn’t have to. Thanks to his extraordinary willingness to rewrite policy in favor of the state’s corporate and financial elite, he had $20 million in his campaign war chest to FitzGerald’s $4.4 million at last count. Which is surely the determinative reason why the PD/NEOMG went on to endorse him despite all the above by a way of a series of conclusions unsupported by the paper’s reporting or anything else. From there, the PD/NEOMG threatened to sue the website Plunderbund for having re-published a video — inexplicably pulled from the PD/NEOMG’s website — of Kasich refusing to answer the editorial board’s questions (edited excerpt of video available here). And all regular people can do is keep repeating to anyone who will listen: When we let the newspapers’ advertisers buy the government, too, we lose our government and our newspapers. Giant chandeliers, green eggs and government cheese. Here’s hoping next election day will be better. And Tim Russo from the Plunderbund archives asking why LeBron tolerates hate speech broadcast by the radio home of the Cavaliers, WTAM 1100. Sorry I didn’t come up with a Cavs season preview but MKC pretty much covered it anyway.